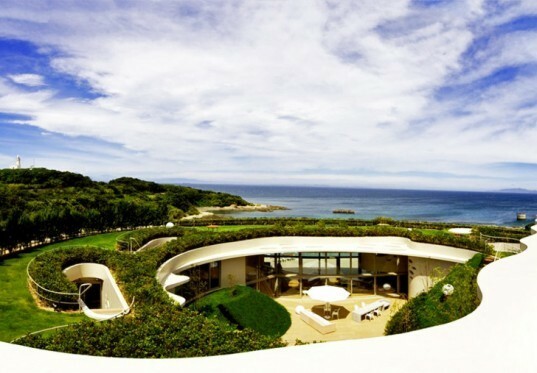 The beautiful Villa Ronde is a self-cooling elliptical oasis situated on the Japanese Coast. Designed by Ciel Rouge Creation, the complex includes a private museum, a beautiful guest house, and a resort. Blending in with the lush surroundings, the green-roofed Villa circles around a central open courtyard that is perfect for dining or sunbathing. The circular shape of the Villa helps protect it by deflect the strong typhoon winds that are common in the area. These same winds help ventilate and cool the interior of the Villa, thanks to the building’s orientation, which emerges and sprouts out of the hillside. The exterior is painted the same color as surrounding rocks to blend in as much as possible with the hill. The entire roof is accessible, and is covered with 30 cm of earth, lush grass, and plants. The green roof helps cool the interior and save energy, and a built-in watering system keeps it healthy and growing. The interior is designed as a continuous loop, with one room leading into the next, creating a consistent and uninterrupted flow of space. Guest rooms lead to an arched interior pool, common areas, and meeting spaces. The furniture chosen reflects the shape of the exterior — softly rounded tables and counters are joined by smooth green and white couches. All of the windows are rounded and elliptical, targeting focal points of the serene landscape while ensuring privacy. Floor-to-ceiling interior windows allow the maximum amount of natural light to shine in. The private museum has yet to be filled, but the spacious rooms and grounds are ready for relaxation! I really enjoy this design! Kudos to the architecture firm! The circular shape of the Villa helps protect it by deflect the strong typhoon winds that are common in the area. These same winds help ventilate and cool the interior of the Villa, thanks to the building's orientation, which emerges and sprouts out of the hill side. The exterior is painted the same color as surrounding rocks to blend in as much as possible with the hill. The entire roof is accessible, and is covered with 30 cm of earth, lush grass, and plants. The green roof helps cool the interior and save energy, and a built-in watering system keeps it healthy and growing. The interior is designed as a continuous loop, with one room leading into the next, creating a consistent and uninterrupted flow of space. Guest rooms lead to an arched interior pool, common areas, and meeting spaces. The furniture chosen reflects the shape of the exterior -- softly rounded tables and counters are joined by smooth green and white couches. All of the windows are rounded and elliptical, targeting focal points of the serene landscape while ensuring privacy. Floor-to-ceiling interior windows allow the maximum amount of natural light to shine in.